Talk about northern exposure! This is a section of a much larger image, released today by the MESSENGER team, showing the heavily-cratered north pole of Mercury as seen by the MESSENGER spacecraft’s Mercury Dual Imaging System (MDIS) instrument. Many MDIS images were averaged together to create a mosaic of Mercury’s polar region, which this stereographic projection is centered on. 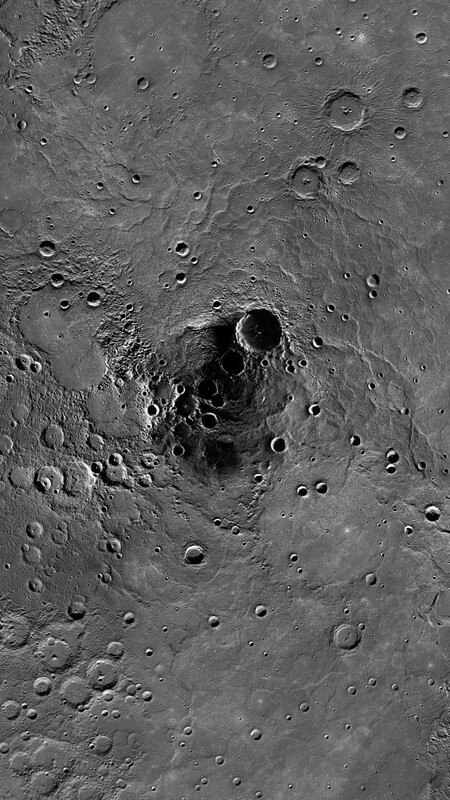 The large and deeply-shadowed crater near the center is Prokofiev, named after a 20th-century Russian composer. Approximately 110 km (68 mi.) in diameter, its permanently-shadowed interior is home to radar-bright deposits that are thought to contain water ice. Read more: Mercury’s Shadowy North Pole — Universe Today.